A coalition of industry organisations has called for Germany to raise its offshore wind targets to 20GW by 2030 and then 30GW by 2035 after installations slowed last year. This would mark an increase from the country’s current ambition of having 7.7GW of offshore wind capacity 2020. Groups including the German Wind Energy Association (BWE), Stiftung Offshore Wind Energy and the German offshore wind energy agency (WAB) also called for a special tender of 1.5GW of offshore wind capacity to be held in the first quarter of 2019. 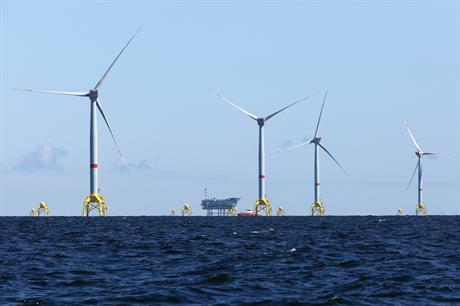 The coalition — completed by German Wind Farm Operators Offshore (BWO) and VDMA Power Systems — urged the German government to provide clarity on measures to boost offshore wind capacity, and to move forward plans for an offshore wind test site. 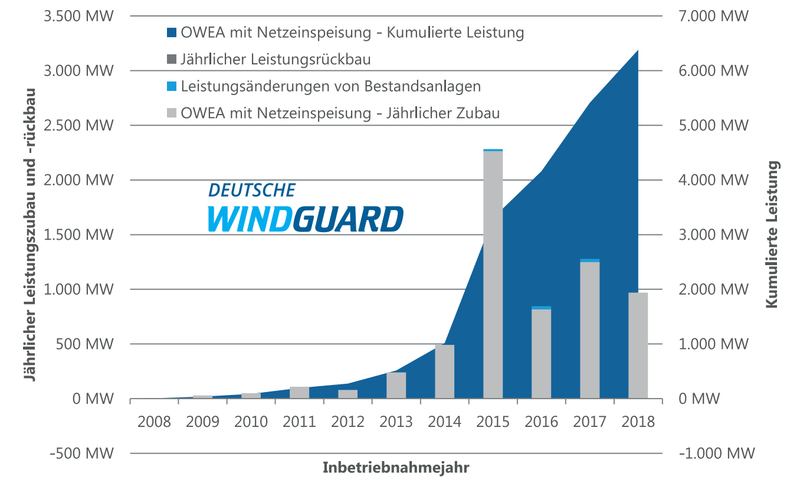 Deutsche WindGuard figures showed 969MW of new wind power capacity was added in German waters in 2018 (above), bringing the country’s cumulative offshore total to 6,382MW by the end of the year. This figure is down from the 1.25GW installed in 2017. However, it does not include 276MW of installed capacity that has not yet been connected to the grid, and 112MW of capacity awaiting a final investment decision. But even with plans for further additions, meeting the government’s target of sourcing 65% of German electricity generation from renewables by 2030 is impossible, according to industry representatives. Last year, Germany’s coalition government approved plans to tender an extra 4GW of onshore wind between 2019 and 2021, but made no such provision for offshore wind. This could still be amended by the German government, the industry group suggested. The coalition conservative CDU/CSU and social democrat SPD parties instructed the Federal Maritime and Hydrographic Agency (BSH) to prepare a scenario framework for reaching between 15GW and 20GW of offshore wind farms. However, there is still a lack of concrete policy measures to help boost offshore wind capacity figures, the industry organisations claim. In a statement, the industry coalition said: "2019 must be the year of progress in energy policy. "Offshore wind energy is central to achieving the climate protection targets and ensures value creation." Deutsche WindGuard’s figures also reveal the increasing power of turbines used in German waters. Last year, 136 turbines with an average power rating of 7.125MW were installed off the coasts of Germany for a total capacity of 969MW. By the end of 2018, 1,305 turbines with an average rating of 4.89MW had been installed for a combined capacity of 6,382MW. This average power rating is up slightly from the cumulative average one year earlier: By the end of 2017, 1,169 turbines with a combined capacity of 5,413MW were installed, meaning the average power rating was 4.63MW.